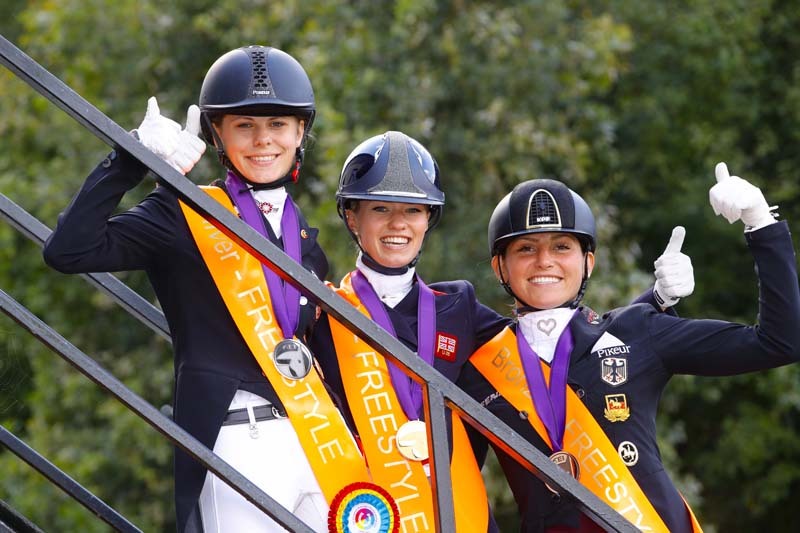 Exciting British newcomer, Charlotte Fry (22), posted her second sensational victory of the past two weeks when winning today’s Freestyle at the FEI European Dressage U25 Championships 2018 in Exloo, The Netherlands. Just 12 days ago the Dutch-based Yorkshire rider, who trained with British legend Carl Hester during her teenage years, claimed the 7-Year-Old title with Glamourdale at the Longines FEI World Breeding Dressage Championships in Ermelo (NED). This afternoon she added another gold medal to her collection when posting a great score of 82.145 with the lovely 10-year-old gelding, Dark Legend, to be crowned U25 Freestyle champion. The result ensured she went home with a full set of colours, having posted the biggest individual score in Wednesday’s Team Championship to boost Great Britain to bronze medal position, and slotting into silver medal spot behind yesterday’s Grand Prix winner Jil-Marielle Becks (20) from Germany. Becks was joined by Bianca Nowag (Fair Play), Juliette Piotrowski (Sir Diamond) and Lisa-Maria Klossinger (FBW Daktari) to top the team standings with a score of 219.706 which left them well ahead of their Dutch rivals in silver medal spot. Carlijn Huberts (Watoeshi), Maxime van der Vlist (Bailey), Denis Nekeman (Boston STH) and Jeanine Nieuwenhuis (TC Athene) racked up a final tally of 212.765 for The Netherlands. But the British foursome of Fry, Ryan Todd (Charlex Eskebjerg), Rebecca Jane Edwards (Headmore Delegate) and Claire Gallimore (Annette Ballerina) were hot on their heels in bronze when posting 212.118. Becks, who with her 10-year-old chestnut gelding Damon’s Satelite was an individual bronze medallist at the Young Rider Championships in Valencia (ESP) in 2016, won yesterday’s Grand Prix with a score of 75.385, while Fry took silver when posting 75.308. Bronze went to Denmark’s Victoria Vallentin (20) who rode Ludwig der Sonnenkoenig to a mark of 74.000. Fry turned the tables today however when pinning Becks into silver in the Freestyle, and it was the German rider’s team-mate, Klossinger (25), who scooped bronze this time around with FBW Daktari. She said that Dark Legend is a very nervous horse. “This is the first show he felt confident in the ring, so he peaked at a good time!” she pointed out. “Today was a really good test, he couldn’t have been better, he really rose to the music and danced to it!” she added. And her plans for the future? “To compete at the Olympic Games some day – but for now I just want to get my feet back on the ground and start training again!” she said. Everyone was singing the praises of the venue at Hippisch Centrum Exloo where the Organising Committee stepped up to the plate at very short notice following the withdrawal of Roosendaal. And the quality of the performances from the dressage world’s rising stars left even the judges in awe. “What we saw here this week was almost at the same level as senior riders, and it’s really very exciting!” said Ground Jury President, Francis Verbeek-van-Rooy.